It’s been an angry sort of offseason, which hasn’t been very enjoyable. I find the most reliable cure when I’m angry at baseball is to watch baseball. Baseball is pretty great. So with spring training upon us, I set out to watch some baseball and get back in the spirit of things. But I couldn’t shake that angry feeling. I found myself somehow watching video of ejections, the moments when our guys are at their angriest. Including spring training and the postseason, there were 197 ejections in Major League Baseball in 2017. Using the meticulously maintained Umpire Ejection Fantasy League, I watched them all. It’s nice when people embrace the things they like, and I wanted to feel like I was a part of something other than being angry. Others have endeavored to unpack ejection data, but that isn’t our purpose today. I was interested in the aesthetics of ejections, the angry walks and grumpy faces. I sought to construct a taxonomy of baseball ejections. This represents the first batch of categories. Another batch will follow. 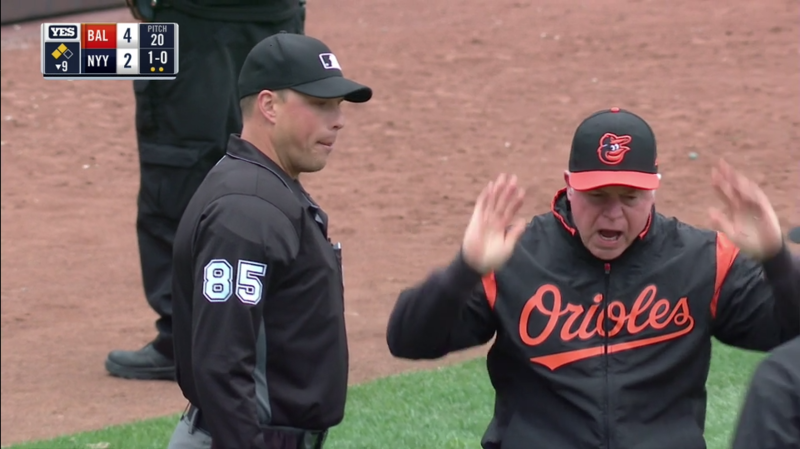 Home-plate umpire Stu Scheurwater ejects Buck Showalter. Ejections of this variety observe predictable stages of how much talking the player or the manager is actually doing. First, we have Some Talking. Here’s Buck Showalter, preparing to do Some Talking. Some Talking clarifies the balk rules and asks, “Hey, don’t you want to give us that zone next time?” Some Talking is a productive way to deal with a project that has gone off the rails at work. 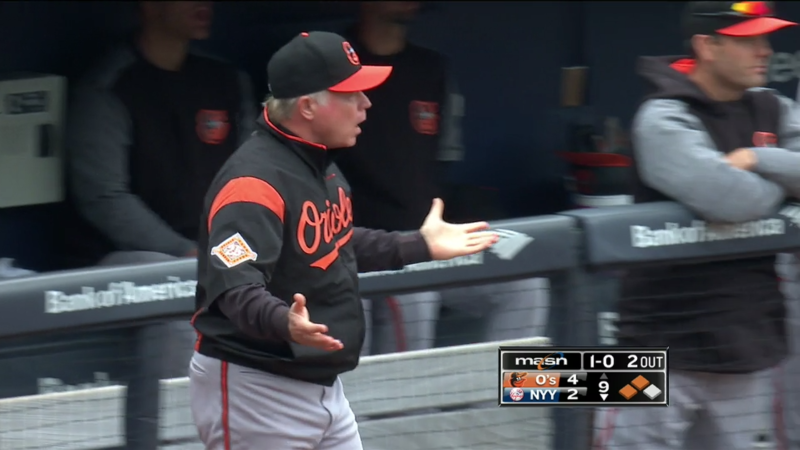 Some Talking is the moment when Showalter’s job is the most like the jobs we have. But they don’t stay at Some Talking. The lousy trick of Some Talking is that it assumes, despite innings and innings of evidence to the contrary, that talking will be persuasive. And, of course, it isn’t. Buck isn’t going to get this umpire to ask his colleagues for help or to put the runner currently on third back on second or to avoid extra innings. And once the guy doing Some Talking realizes he’s not getting that called third strike back, his loquacious little heart Keeps Talking, so he is soon doing A Lot of Talking. The stages of I Kept Talking can change on you so quickly. A Lot of Talking involves pointing and the stamping of feet and many, many swear words. This is no longer a productive brainstorm to address a failed project. This is flipping double birds and storming out of the conference room with a slide left. There were 41 gentleman who did so last year, ejected 48 times for their outbursts. And at some point, they all transitioned to the final stage of I Kept Talking — namely, Behold the Rarrr, I’m Done Talking — for those who have, after much talking, finally said their piece. 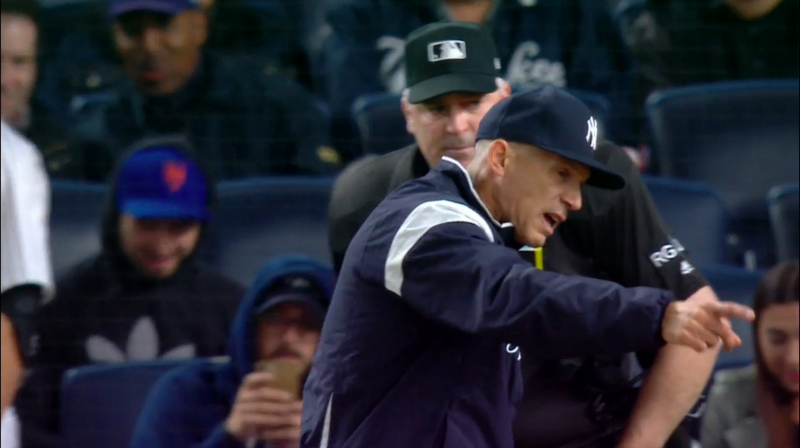 Home-plate umpire Bill Welke ejects Joe Girardi. 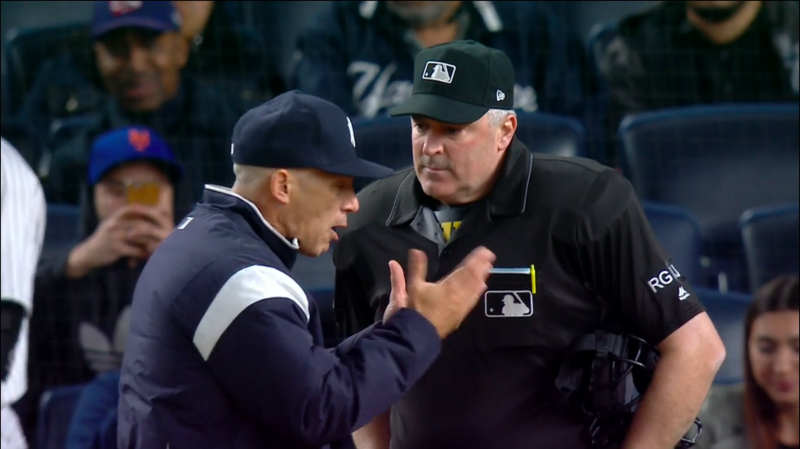 Joe Girardi is the most persnickety member of your high-school debate team. He makes his entrance with a determined, fussy little walk, exuding all the confidence of a drunk man who is delighted to discover he can still manage to walk in a straight line and so is breathless to go as fast as possible. … oh, you’re not persuaded? Home-plate umpire Dan Iassogna ejects Marwin Gonzalez. Perhaps I might illustrate my point with a few tables? Home-plate umpire Marvin Hudson ejects Josh Donaldson. I tried not to laugh at the little guy, because he was upset and had pushed so far past the point of normal toddler exhaustion, but I couldn’t help but tell him that it doesn’t get any easier as we get older, especially when we’re tired. Last September, Josh Donaldson did this after getting tossed in the 18th inning. He knows what I meant. Third-base umpire Joe West ejects Jeff Banister. One of the burdens of adulthood is knowing how to give healthy expression to your feelings in public. We have to feel our feelings; if we don’t, they have a way of coming out sideways at inconvenient times. But we also have business to do. Unlike when we were younger, we can’t yell every time we get angry. We aren’t supposed to scream at our neighbors when they just leave their recycling bins at the curb, for days, Carl. WHOLE DAYS. We are supposed to avail ourselves of adult methods of conflict resolution. Jeff Banister could have challenged whether or not Tyler Smith was hit by a pitch. He should have; that was the adult thing to do. But instead, he decided to yell at the umpire. Life’s burdens proved too great. Steve Buechele tried to offer an alternative method of communication. Like me, however, Banister isn’t big on prop comedy. Home plate umpire Brian O’Nora ejects Eugenio Suarez. Suarez then slammed his bat and that was fine. “Blow off steam; feel your feelings.” But then he must have called O’Nora’s mother a ——‘ —– and that was it. He had to go. You can’t call a guy’s mother that. Not here, in a place of business, with so many other mothers and their kids around. The bat was fine, and the squawking was acceptable, but we’re trying to have a civilization here, bub. 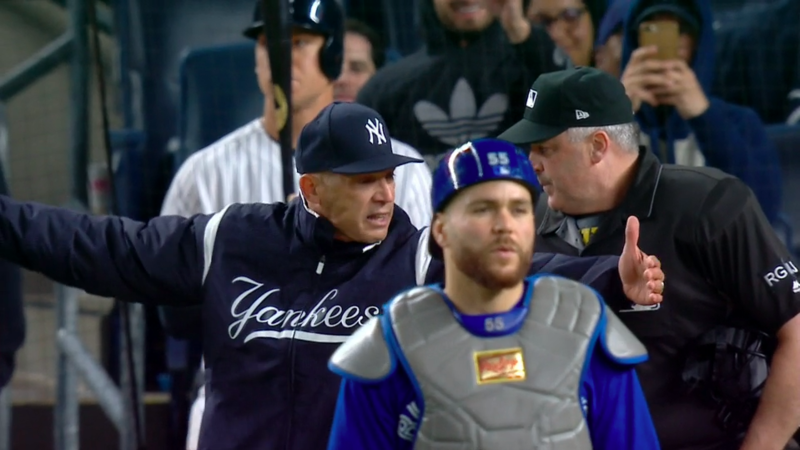 Home-plate Scott Barry ejects Joe Girardi. The histories of Ancient Greece are peppered with tales of conquering hordes pillaging enemy temples, disrespecting their gods, and desecrating their most sacred places. 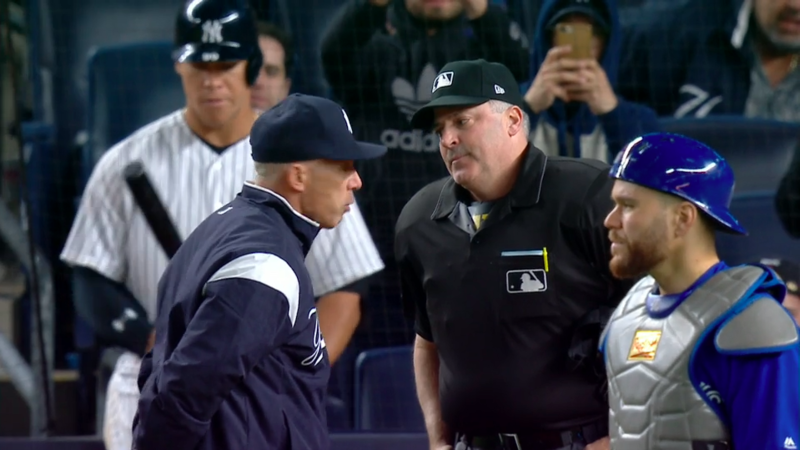 In his own small way, on May 20, Joe Girardi exhibited similar disregard for baseball’s altar. Home-plate umpire Tom Woodring ejects Yasiel Puig. 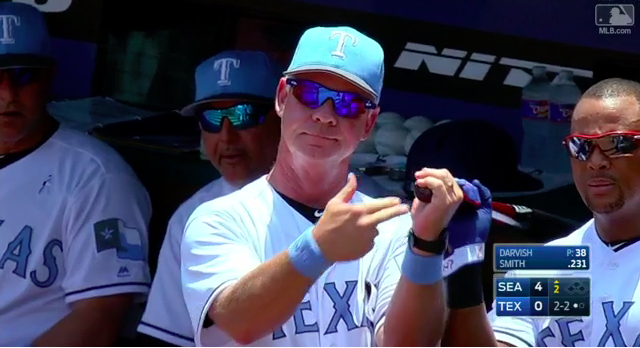 Umpires always bring the false sense of confidence of a still-cool-person-age middle-school substitute to ejections. After being called out, Yasiel Puig throws his bat and gets tossed, but he does not protest. Woodring thinks he’s in the clear. He’s hot and his back is all sweaty, but his little “get out of here!” gesture is casually confident. “Heh, you’re so out of here.” But he’s made the mistake all substitute teachers make: he’s forgotten no one likes him. Puig takes his time gathering his things. Like the cool kid in your seventh-grade class who once snuck cigarettes, he’s defying teacher. But the power isn’t really in the defiance. The power is in how long the defiance takes to develop. The time allows you to think about how he’s defying teacher and how cool he looks doing it and how cool you or the smiling guy in glasses would look doing it. The crowd gets it, too. Puig was a bit of a jerk; he snuck some cigarettes. But Woodring made a mistake. 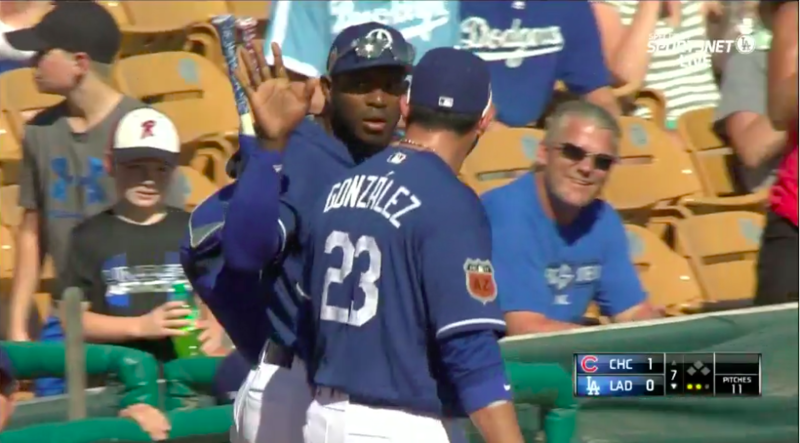 He didn’t realize how cool Puig would seem. He forgot it had been months since the crowd had seen baseball. He forgot, in a moment of false confidence, that no one likes teach. No video is available for this ejection, which centered around Logan Forsythe wearing a first baseman’s glove when he shouldn’t have. But if video did exist, it would likely feature three guys standing around, muttering variations of “What?” and “Wait, me?” and “Huh?” for several minutes before Bill Haselman gets angry and yells, all while the crowd wondered if they still liked baseball or if someone on the field was being arrested. 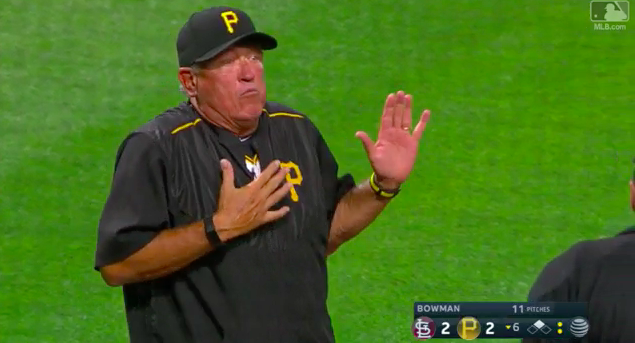 Home-plate umpire Phil Cuzzi ejects Clint Hurdle. Home-plate umpire Jerry Layne does same. There is a story we tell on my mom’s side of the family that is almost certainly apocryphal. It involves my great uncle Frank (may he rest in peace), who married into the family and who we maybe sorta think was possibly briefly a made man. The legend goes that after my grandparents’ wedding, great uncle Frank offered to get them a television. A television of your own was a big deal back then. An expensive thing. A luxury. Great uncle Frank told my grandpa, “I’ll get you a TV. But? You can’t tell anyone where you got it.” Frank claimed nothing nefarious had gone on, but my grandpa declined. At least twice a year, a manager makes the faces I imagine Frank made while having this conversation. Clint Hurdle was responsible for both in 2017. Won’t You Please Fight Me?/Okay, FINE! Second-base umpire Tom Hallion ejects Rick Renteria. Rick Renteria is hopping mad and spoiling for a fight. That isn’t unusual for him. Renteria was bounced eight times last year — more than any other person, manager or otherwise, in baseball. He’s hopping mad, spoiling for a fight, and he’s hoping Tom Hallion will indulge him. Sometimes you just have the itch. For a long time, though, Hallion resists. That’s sort of admirable. It’s hard not to fight when someone else wants to. You feel left out, and our culture has taught you to worry your opponent will think you’re a wimp, and he is being so annoying. For a while, Hallion held out. But then he couldn’t anymore. There’s a moment in the middle of this squabble when it looks like they have been sped up, but they haven’t been. They’re really gabbing and sticking their necks and faces out that much and that quickly. And for what? All they are racing toward is their inevitable deaths and the feeling of shame that will come over them at 3 am some night, after they’ve spent time teaching their grandchildren about sharing and what we owe to each other, when they realize they omitted the events of this inning. They didn’t mention what happens when we fail to hold out a little longer. So in addition to teaching lessons to the people they love, they also engaged in a bit of small but meaningful lying. Home-plate umpire Sam Holbrook ejects Adam Jones. 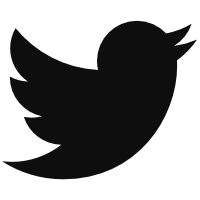 Our private lives function within the context a number of small, interwoven understandings. If I cook, you do the dishes. If I’m running late, I’ll call. Not touching? Can’t get mad! Baseball relies on its own understandings. 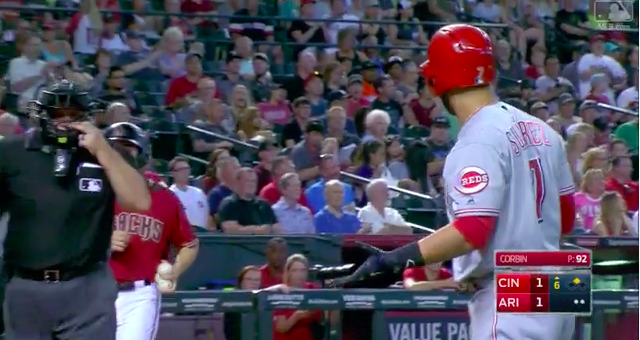 If a batter wants to ask gentle questions of the strike zone, he can do so, provided he’s not looking at the umpire and is only a little sassy. Similarly, he can complain about the strike zone after a strikeout, provided he is walking away, facing his dugout, and keeping his voice down. Adam Jones doesn’t appear to have kept his voice down; the wide-eyed reaction of the gentleman just over “Hardwood Floors for Less” is not one you have in response to a quiet man. Some might say Jones violated an understanding. But they’re forgetting that Sam Holbrook ejected Orioles starter Kevin Gausman in the second inning for accidentally plunking Xander Bogaerts with a slider that got away from him. These teams were trying to slowly murder each other, but umpires shouldn’t force players to answer for other people’s sins. That’s an understanding, too. If your partner regularly refuses to do the dishes, eventually you stop cooking, right? We hoped you liked reading A Semi-Complete Taxonomy of Baseball Ejections, Part I by Meg Rowley! Please continue the series until you have done all 197.